Helambu Circuit Trek | Adam Tours & Travel Pvt. Ltd. The Helambu Circuit trek is specially designed off the beaten trail that absolutely highlights the calm and tranquil area for trekking and the trails are blissfully famous for its outstanding natural beauty, fascinating culture and favorable climates. The Helambu circuit trekking landscape is classic Himalayan foothills, with plenty of dramatic rises and plummeting descents. 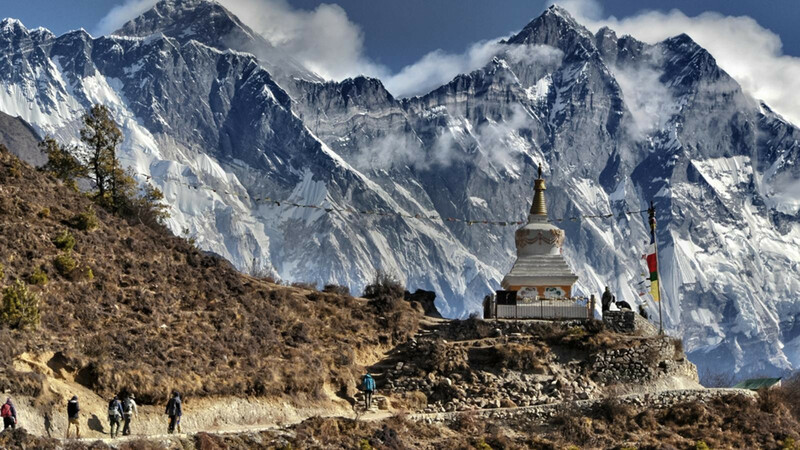 On this grand Helambu trekking adventure, discover unchanged central Nepal: trails pass through dense forests and traditional Buddhist villages and while the mountain views are genuinely inspiring. You pass through dramatic ridges, villages inhabited by the Tamang people, lush forests of rhododendron, conifers, oak, and also this trail passes through mountain cattle grazing on rich alpine pastures under the watchful eyes of their herders. Breathtaking mountains views emerge on yours ascent as the vegetation becomes sparser and the conditions more challenging. Helambu Circuite Trek is easy to get from Kathmandu and trek takes a week so it is best trip for those trekkers who do not have the longer holiday in Nepal trip. The trail to Helambu climbs on to the Shivapuri ridge from where there are sweeping views of the central Himalayas. This Helambu village Trek will bring us through the Langtang National Park which inhabits a wealth of rare birds, wildlife and unique plants and flowers. Helambu Circuite Trek is easy to get from Kathmandu and trek takes a week so it is best trip for those trekkers who do not have the longer holiday in Nepal trip. During trek we will pass through spectacular villages of Kutumsang, Chisopani and Sermathang with their stunning panoramic views. We will pass through the villages of Melamchi Gaon and Tarkeghyang, Helambu Circuite Trek is easy to get from Kathmandu and trek takes a week so it is best trip for those trekkers who do not have the longer holiday in Nepal trip in which we will pass through, provide the cultural riches which will take us into the heart of Nepal. The Sherpa village of Tarkeghyang that forms the focus of Helambu is a charming enclave of farmers and yak herders. They are different from Sherpas of Khumbu region and have unique culture. We go along the south ridge through Sermathang, down to the river at Melamchi, the site of a mega project to bring drinking water to Kathmandu via a series of tunnels. You will experience the Yolmo culture of high mountains villages, marvel at vistas of lonely high mountains and watch enthralled as the farmers toil in the fields using handmade tools and teams of water buffalo. The Helambu Sherpa valley trekking trail takes us through the National Park of Shivapuri Watershed and Wildlife Reserve, which inhabits a paradise of flora, including exotic orchids, and a myriad of wildlife and birds. You will trek to villages with spectacular panoramic views including Ganesh Himal Massif, Langtang Himal, Rolwaling Range and distant views of peaks in the Everest region. With diverse range of brilliant green valley’s misty rhododendron forests and distant horizons of snowy peaks, Helambu is the ideal short trek. Helambu region lies to the north of Kathmandu and offers the nearest experience of Sherpa culture without having to go to Everest region. This Helambu circuit- Sherpa valley expedition is an easy and enjoyable trip for the trekkers who wish to experience adventure and closeness to the Himalayan trail without going at high altitude. Some of the main attractions of this region include: exquisite gompas enshrining statues of Guru Rinpoche, Sakyamuni, and Chenresig (Avalokitesvara). The very next morning, after breakfast you will leave for a full day sightseeing tour around Kathmandu valley. You can visit sacred Pashupatinath Temple and Swyambhunath, very ancient and essentially enlisted in UNESCO World Heritage sites. The biggest Buddhist Stupa at Boudhnath and the fine arts and historical architecture of Kathmandu Durbar Square reflecting the ancient Nepalese culture are highlighted on our guided tour. A visit to Patan City will enchant you with its famous fine arts and historical architecture. On return to your hotel you will have time to explore the local area, have dinner and perhaps take a leisurely stroll through the popular streets.